When this buck became available we decided he was a "must have" for our herd. We had a son and daughter from him from a previous breeding, and loved what we saw. He has some spectacular bloodlines from the Poppy Patch herd. The pictures of his dam and half sister speak volumes for his genetics. We are so happy to have him here in our herd! Dark Moon's pedigree is packed for both show quality and great milk production. His half sister, Tiny Town S Blue Luna *M, was a 2013 ADGA Elite doe. His dam, CH Tiny Town Blue Moon, is classified VEEE 90. His lovely littermate sister, Ranchocabra Bedtime Story, is pictured below and also had LA score of VEEE 90. The beautiful doe above is Dark Moon's dam, CH Tiny Town Blue Moon. She is appraised at VEEE 90 Thank you to Tiny Town Nigerians for allowing us to share above picture! Pictured above is a bit more recent pic of this handsome boy without his winter woolies (however not the most wonderful clip job as this stinky boy was not thrilled with his day of beauty). He has some lovely kids on the ground, throwing very correct colorful daughters. littermate sister to Dark Moon, "Ranchocabra Bedtime Story"
This is the littermate sister to Dark Moon, "Ranchocabra Bedtime Story" This beautiful doe recently classified at 90 VEEE. It is easy to see from these pictures why she scored so well, lovely doe! Big thanks to Ranchocabra Goats for allowing us to share these pictures. This little man is a welcome new addition on our farm. 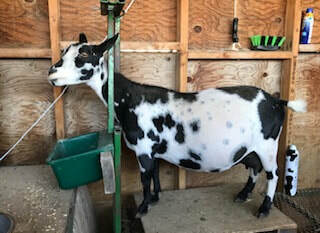 He is the son of SG Pholia Farm RD Meet Virginia 4*M. This lovely doe is a 2015 and 2016 Elite doe and scored at 90 points in linear appraisal in 2017! Virginia was also the 1st place yearling milker at the 2015 National ADGA show. She has also been producing over 5# per day in her lactation this year as a 3 year old. Whiskey also has some great genetics coming from his sire's side as well. His paternal granddam, SG Sugar Moon RB Gianna, scored 89 VVEE (as a first freshner). Gianna has also been on the ADGA Elite doe list in 2015, 2016 and 2017 (99th percentile)! Both lovely does are pictured below as well. We were fortunate enough to be allowed to have a breeding from a great buck, Poppy Patch Guilty As Charged. This boy "Alcatraz" was the result of that breeding. He is developing into a very stylish dairy buck. We have kids on the way from him and are excited to see them hit the ground/ He is being offered up for sale since we purchased his sire this summer. We are a bit heavy on bucks, so will use him for a bit and move him onto a new herd. Don't miss out on this one! iThis cute boy was named after a favorite line in a movie, "I'll be your huckleberry". We thought is fit, since this little guy's sire is Doc Holiday. He combines some genetics we have liked in the Asher's herd. He has a double dip of a lovely Rebel Acres doe that is a foundation doe in their herd. He also adds in a great line from Wee3 Farms JJ Justin Case. "Huck" as we call him, has been stylish and dairy from the get go. We will be watching to see what this boy can do! We are very excited about adding this buck to our herd! He has both type and production in his genetics. His dam is Creamery Creek BZ Izadora VEEE 90. She is a great producer and the pictures below speak for themselves, she has a beautiful well attached udder, built to produce! His sire, +B Old Mountain Farm Bold Hart VEE 89, is the son of Old Mountain Farm Bold Elk who was the 2018 ADGA Premier Sire. The genetics in the package just don't stop! So thankful to Onaqui Nigerians for allowing us to add this stellar buck to our herd!